William Stevens, Mary’s husband, died on 12 February 1837, aged 72. They were buried in Bosbury Churchyard. Eighty-three Bosbury people died in the Ledbury Union Workhouse. 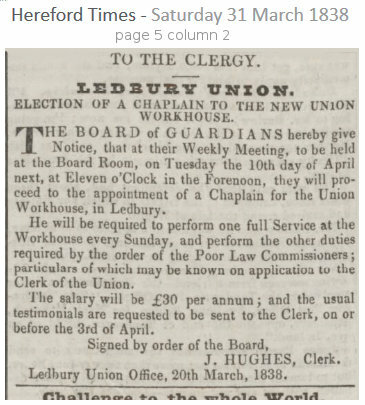 In May 1914 both William Sivell Lane and Edward Thomas Lane were on the Board of Guardians of Ledbury Workhouse (see Abergavenny Mail report in ‘Newspaper Snippets’).